Assessment of Anwar Sadat and the 1973 War, as well as the event's global implications. Unfortunately, due to sales rights restrictions, we cannot offer Hero of the Crossing for sale in your country. • Assessment of Anwar Sadat and the 1973 War, as well as the event's global implications. In eleven dramatic years, Anwar Sadat changed history—not just that of Egypt, or of the Middle East, but of the entire world. As the architect of the 1973 war against Israel, he gained the support of other Arab nations and inspired the oil embargo that transformed the global economy. Following the war, however, he forever ended Arab aspirations of unity by making peace with Israel. Early in his presidency, Sadat jettisoned Egypt's alliance with the Soviet Union and turned to the United States, thereby giving the West a crucial Cold War victory. Sadat's historic tenure still resonates in the twenty-first century as the Islamic activists—whom he originally encouraged but who opposed his conciliatory policy toward Israel and ultimately played a role in his assassination—continue to foster activism, including the Muslim Brotherhood, today. Thomas W. Lippman was stationed in the Middle East as a journalist during Sadat's presidency and lived in Egypt in the aftermath of the October War. 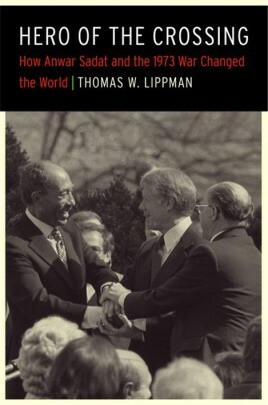 He knew Sadat personally, but only now, after the passage of time and the long-delayed release of the U.S. State Department's diplomatic files, can Lippman assess the full consequences of Sadat's presidency. Hero of the Crossing provides an eye-opening account of the profound reverberations of one leader's political, cultural, and economic maneuverings and legacy. This is a well-written and thoroughly researched book and is suitable for all levels of interest and understanding. I have no doubt that it will become a core text for scholars of the Middle East.